Kirloskar Brothers Limited (KBL), a fluid management pump manufacturer headquartered in Pune, India, has turned to additive manufacturing to create valuable cost and time cuts to its spare part supply. 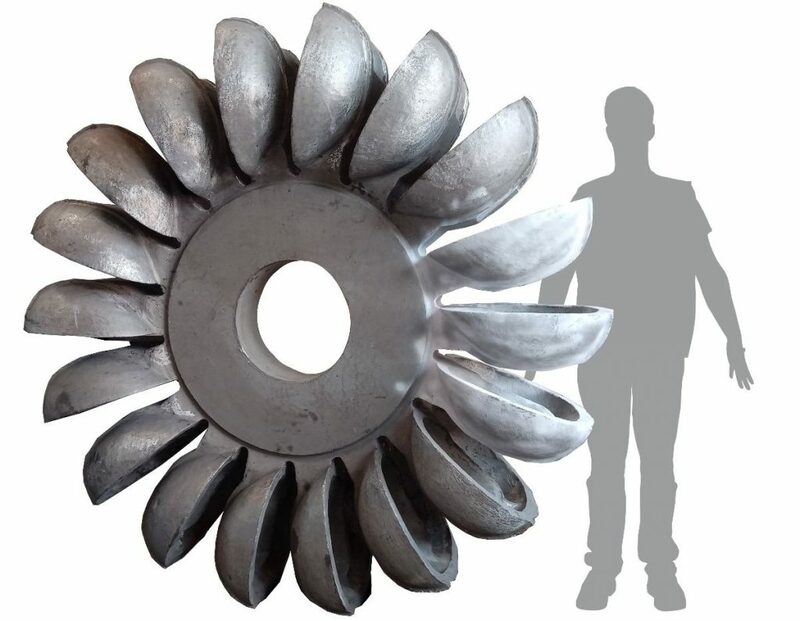 Working with German industrial 3D printer manufacturer voxeljet, KBL has created 3D printed castings for a 3.2 ton (3200 kg) Pelton Runner, used to generate power from the impulse of moving water. With traditional manufacturing techniques it would typically take KBL upwards of two months to produce the complete mould set needed for this part. With voxeljet 3D printing, the whole process took just a matter of weeks instead. voxeljet’s proprietary technology is inkjet-based 3D printing, covering the standard binder jetting process and the newer High Speed Sintering technology. The processes are compatible with sand, plastic and ceramic materials, with sand well suited to metal casting applications in magnesium, aluminum, iron, steel and brass. For the KBL Pelton Runner, a total of 20 individual models were required: the cope, drag and 18 bucket cores, which equated to 5.700 kg in silica sand and furan binder. The full job was completed on voxeljet’s biggest 3D printer, the VX4000, which has a build area of 4,000 x 2,000 x 1,000 mm (L x W x H). It took 72 hours to print, and afterwards only required KBL’s proprietary coating for post processing. After assembly, the model was used to cast a 2.000 mm diameter Pelton Runner in CA6NM stainless steel. The casting had a total yield of 56% (weight of the casting divided by the weight of the total amount of metal poured). Have KBL and voxeljet produced your 3D Printing Application of the Year? Nominate them and more now for the 2019 3D Printing Industry Awards. For more of the latest 3D printing applications news news subscribe to the 3D Printing Industry newsletter, follow us on Twitter and like us on Facebook.